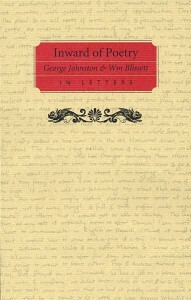 Inward of Poetry, a book based on years of correspondence between the poet George Johnston and his friend, scholar and editor William Blissett, is a fascinating peek inside what editor Sean Kane calls “a sort of golden age of English Studies in Canada.” I was lucky enough to steal a bit of Sean’s time to ask a few questions about Inward of Poetry, which veered into questions about how letters and interpersonal communication has changed since the letters at the core of Inward of Poetry were written. PQ: What inspired you to write “Inward of Poetry”? SK: I wanted to discover the lost world of my teachers. There was a community of them, and they represented a sort of golden age of English Studies in Canada. 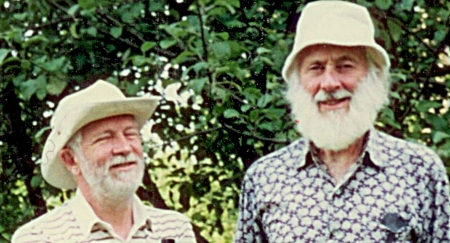 That was when professors taught the life of the imagination and were friends to creative writers, if not poets and short story artists themselves as Johnston and Blissett were. It wasn’t enough to teach literature – they also had to make it. So it was a time when the work done in English departments overflowed into literary magazines and publishing. Much of Canadian literature was born and nourished in that liberal humanist world of the sixties and seventies. For any creative spirit who ventures into a class today expecting to discuss the literary imagination and instead hits a wall of post-structuralism, post-colonialism, postmodernism, and cultural materialism, it may be liberating to check out that liberal humanism. Sure, it had its innocence, and innocence is blind. But it’s worth revaluing. It might even be worth a renaissance. PQ: What are some of the challenges of editing a collection of letters? SK: The biggest challenge is not to edit a straight collection in the first place. Editions of correspondence can be musty and archival – of documentary interest only. I excerpted the letters and embedded them in a narrative. They float along in a stream of gossip, anecdote, biography, social history, travelogue, family album, and first-draft poetry, and catch energy from that mix. In places, the book is orchestrated as a polyphony of voices, so it has the immediacy of conversation. I suppose a literary critic will identify these innovations as a new historicist “thickening,” but to me it’s turning the collected letters genre inside-out. PQ: The ways we communicate have changed so much – many people often say they always carry a phone and never use it to call anyone (only text, email, etc), and most can’t remember the last time they sent a letter by posted mail – how do you think this will affect the publication of volumes like Inward of Poetry in the future? Do you think future editors will be compiling volumes of tweets and text messages? SK: Yes, we don’t pour our being into personal letters now. I remember writing and receiving letters myself: they said zot-all, but they were acts of embodiment and so they were essentially artistic gifts. Johnston wrote his letters in an elegant calligraphy. This went along with his bee-keeping, churchbell-ringing, and composing poetry while walking. 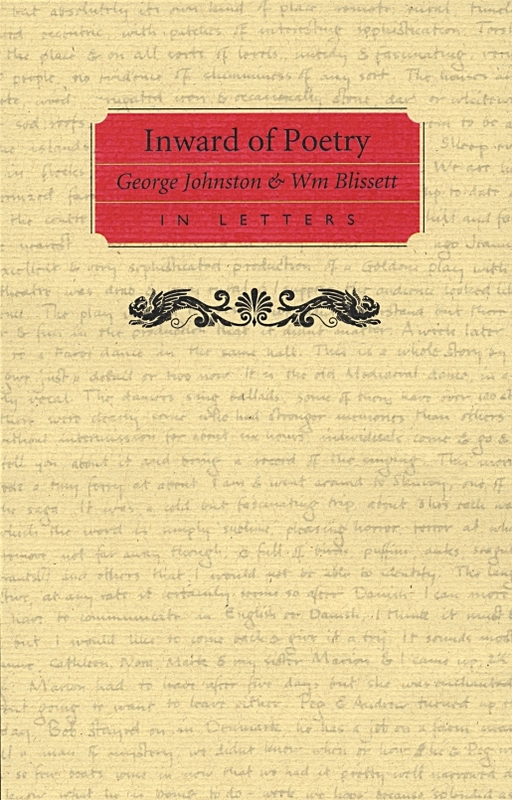 Blissett’s letters are early modernist poems – epic reach through jumbled allusion. Will the art of letter writing come back? This is an interesting question, and like so much else its answer is found in political economy. Johnston discovered, I think later on in his life, that he resembled the Victorian anarchist William Morris in outlook. And the thing about Morris, with all his original designs for wallpaper, textiles, ceramics, furniture and books, is that he contested exploited labour and mass-produced vulgarity; he contested drudgery and trash with flash. He waged a community war against schlock with a notion of work as creativity and what he called “the art of unconscious intelligence” that grows with making beautiful things by hand. Something The Porcupine’s Quill understands! So my roundabout answer is that we may come again to value the personally written letter and other forms of embodied communication when we break out of mass production and distribution and the social hierarchies that drive economic centralization. When we foster decentralized power, slow money, and producing our food and energy locally. This isn’t to say we’ll live like hobbits, though Morris’s fantasy novels were an important influence on Tolkien, but that the roar of capitalism will give way to an inwardness in which spoken poetry, inscribed letters, and lifelong friendship will be central. A tough act to follow, right? But I implore you, Quill friends, to pick up your pens (or quills, as the case may be!) and write to someone! If you’re interested in learning more about Inward of Poetry, scoot on over to our page to check it out! Inward of Poetry launches on October 11th at the Arts and Letters Club in Toronto. Not only are we celebrating the book’s launch, but also William Blissett’s 90th Birthday! This entry was posted in Letters from the Porcupette (the Intern's Blog) and tagged George Johnston, interviews, Inward of Poetry, letters, nonfiction, poetry, scholarship, sean kane, William Blissett. Bookmark the permalink.